Last Saturday was the meetup for my photography group, I scheduled it in Thibodaux, which is the home of Nicholls University (excellent culinary program, naturally) and about 2/3 of the way to New Orleans from Abbeville. 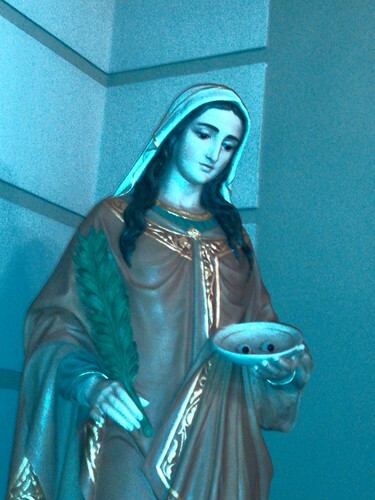 I confess to an ulterior motive for having it there: the photography project I’m working on right now (and for the forseeable future, as I keep discovering new potential additions) is called Saints of Louisiana, and I read that the Co-Cathedral of St. Joseph has relics (an arm bone) of St. Valerie. Alleged, anyway; I mean who’s to say the Pope didn’t just nip off down to the catacombs with a chisel and send any old arm bone off to Louisiana. 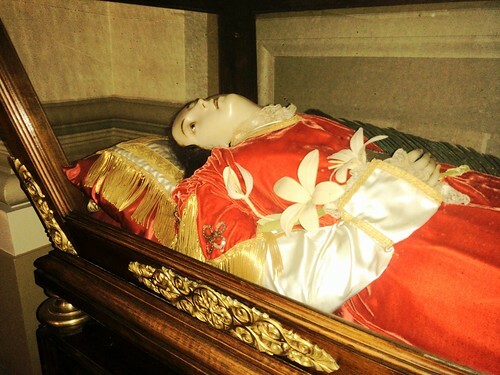 Anyway, they enclosed it in an almost life-sized wax statue, which is in a kind of glass coffin, it’s super creepy. Yes, that is a plate of eyeballs. Afterwards we went to Laurel valley Village, which I’ve been to before but Hope hasn’t. To sum up: Giant sugar co-op has their workers (not slaves, this was after the Civil War) live in a little village, it goes bust during the Great Depression, place falls apart for a few decades until a history professor from Nicholls re-discovers it, they attempt to restore one building and go “Eff this, it’s too much work/money”, they settle for keeping it in a state of “arrested decay”. I think it makes a more interesting photo subject this way, anyway. 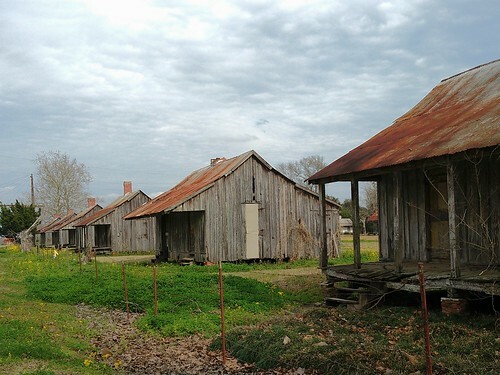 On the drive to Thibodaux, I passed a property along LA-14 in Iberia Parish that had tiny homes for sale and almost drove off the road. I have been obsessed with the Tiny House Movement since shortly after I moved to Louisiana, and I recently saw the documentary TINY: A Story About Living Small, so it’s been on my mind more than usual. Around here most people buy them to use as camps, but they were the real thing all right, less than 200 square feet and on a flatbed. He had 3 different designs, I’d love to see what they’re like inside. It’s a daydream of mine to get one and put it on my grandparents’ old property, although realistically I don’t know if I’d really care to live in close proximity with that many cousins. 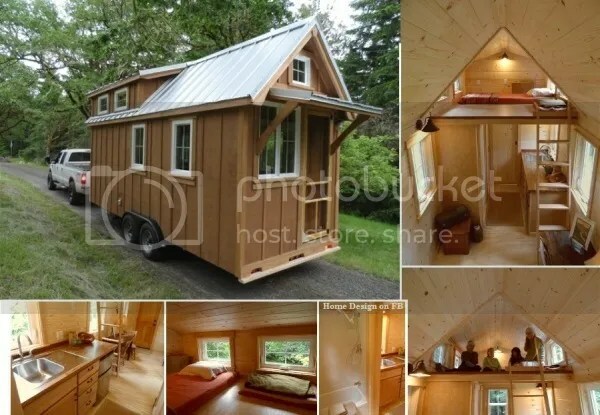 I’m saving for a car right now (my Pontiac has over 180,000 miles on it) and I’m seriously considering getting a truck, because if I have a truck, I can move a Tiny House wherever I need to. Hurricane coming? No problem, I’ll just haul it into Lafayette or Baton Rouge until it passes. Have fun re-building, suckers. I also wouldn’t mind having a boat one day–nothing at all fancy, just there are a lot of places I’d like to see that aren’t accessible by road nowadays (the Sabine Pass Light, Chenier au Tigre, Fort Simon). This is a boat culture and I’m sure I could get a used one cheap from someone who was upgrading.